I first went to one of these custom-made quick-fired style pizza places back in 2012 or 2013 in Charleston, South Carolina after a race. I thought it was cool, but I did not anticipate how the segment would explode. 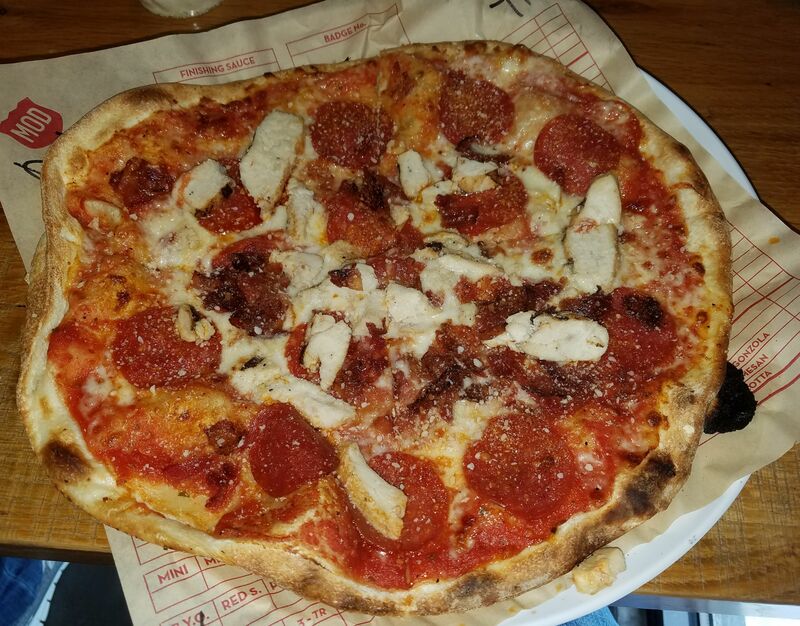 MOD Pizza marks the 4th or 5th place like this that I have tried, and it might just be the best so far. When you enter, you jump right in a line to have your pizza made to order, just like how Subway makes you a sub. Once done, they chuck it in a zillion degree over to cook super fast and then there you go. The pricing is really simple - pay for the size and type of crust you want and away you go. There is no real limit on what you get on the pizza, though they are stingy with the toppings - you have to tell them "more, more, more" a lot if you want more than just a little bit of toppings on there. As you can see, I went against the norm and got a pepperoni, chicken, bacon concoction - something I will often do at these places since extra toppings do not cost anything. I usually regret it since just pepperoni is often better in my opinion, but I am a sucker for free stuff, like most people. This pizza, however, was pretty fantastic. You'll notice right away that there wasn't a bunch of cheese, which sometimes is not a bad thing. It was flavorful and not too filling as the crust is pretty thin. Due to the speed that they have to make it, it is somewhat sloppily constructed and thus not the most visually appealing pizza you'll ever eat, but it tasted really good, so who cares? MOD is a winner in my book and someplace I would be happy to go back to often.